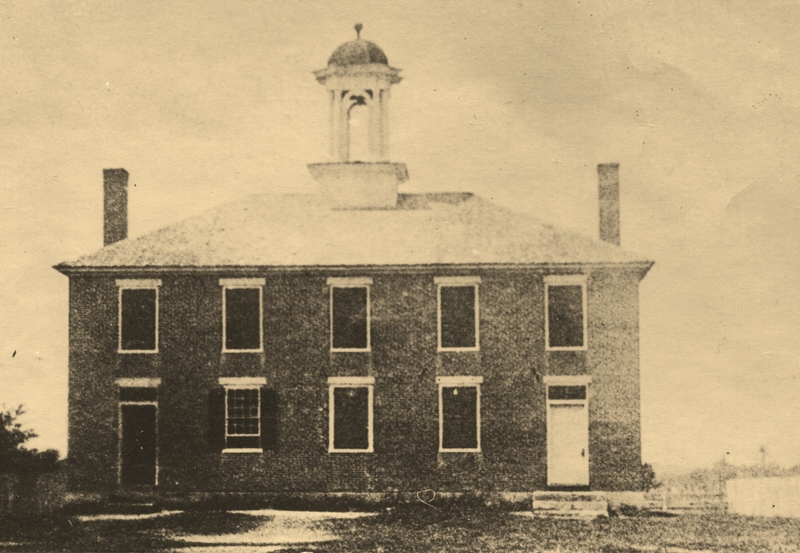 In the spring of 1820, a petition was circulated in the town of Rochester and sent to the trustees of the Newmarket Wesleyan Academy requesting that the institution relocate to Rochester. 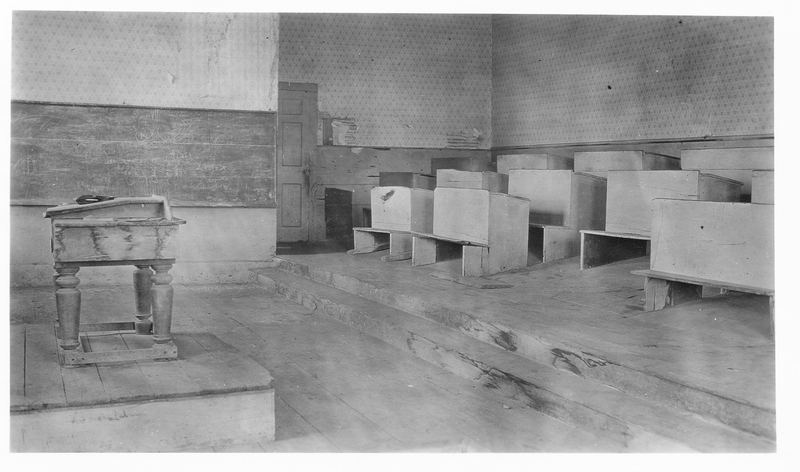 Some Rochester residents were opposed because the school had religious connections, but the move was accomplished in 1827. A lot was purchased from John Roberts Jr. and a two story brick building was erected with a large front yard on South Main Street. The academy did very well for years until enrollment declined in 1846. The proprietors leased the upper floor of building to the International Order of Odd Fellows. Caroline Knight continued to run the school on the first floor until 1872 when it closed. In 1875 the Odd Fellows block, was built in the front yard of school. Abijah Nason purchased the old academy and remodeled it into a two family house in 1877 (now 6 and 8 Academy Street). He also built another house on an adjoining lot. This was evidently the beginning of Academy Street. The name probably came into being at this time. 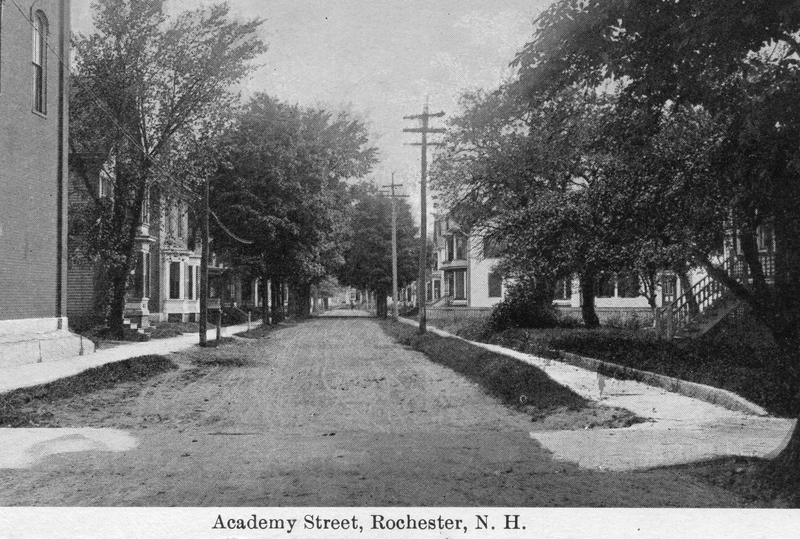 The Rochester Courier of April 13, 1877, reported that there was much building on Academy Street. Mr. Bradley was putting in a cellar for a two story house. Mr. Clark was building a two story house on the south side and Mr. Carter was putting in a cellar. Beautiful, tree lined Academy Street attracted many prominent businessman. Among its residents were Captain Albert Hayes, owner of the Hayes Block, Burnham R. Dewitt, a druggist, and Dr. J.H. Neil. Dr. Lewis Gilman lived at Academy Street with his mother in 1893. N. Thurston Kimball lived in the house on the corner of Academy and South Main Street. The unoccupied house stands there today (1998). Kimball’s deep lot had considerable frontage on the new street. In March 1915, Kimball sold a portion of his lot to Dr. Walter Roberts. The new owner built a handsome eight room house now owned by Strafford Guidance Center at 9 Academy Street.